The sciatic nerve, which is made up of 5 smaller nerves that exit your low back, is the longest and largest nerve in the body. It begins at your pelvis, and passes through your hip region and buttocks, before continuing down both legs. As it moves down each leg, the sciatic nerve branches out into smaller nerves. In addition to providing feeling to both your thighs, legs, ankles and feet, the smaller branches of the sciatic nerve control many of the muscles that make up the lower legs. Sciatica, is a term that describes pain that radiates along the course of this nerve, and it is a condition often diagnosed and treated by chiropractors. When you have sciatica, or pain down your leg, it may be a sign that you have another problem in your body, where pressure is being put on a nerve in your low back. Most commonly, the cause of nerve compression in the lower back is a herniated or bulging lumbar disc. However, sciatica can also be caused by other conditions that target the spine, such as bone spurs, narrowing of the spinal canal and nerve root compression. Other conditions, including pregnancy and tumors, can also affect the nerves in the low back and cause sciatica. Another frequently seen cause of sciatica is Piriformis Syndrome. In most people, the sciatic nerve passes directly under the piriformis muscle in your pelvis; for an unfortunate few (10%) the siatic nerve exits the pelvis and passes through the muscle belly of the piriformis. When this muscle tightens up, or becomes spasmed, it can put direct pressure on the sciatic nerve; the unfortunate 10% are even more susceptible to this nerve pressure due to the piriformis. Often times in men, pain down the leg is due to the fact that men carry their wallets in their back pocket and often sit on them. 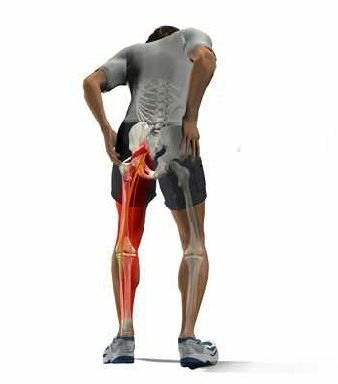 In the majority of cases, pain that begins in your lower back and travels to your buttock and down through the back of your leg, is most characteristic of sciatica. Other symptoms that you may notice in addition to your sciatic pain are tingling, numbness and muscle weakness in the leg that is affected. The severity of the pain can vary from a mild ache to a burning, sharp sensation or even severe debilitating discomfort. At times, the discomfort may be described as an electric shock or sudden jolt of pain. Over time, sciatic pain usually intensifies and becomes more intense when you increase pressure in your body, as in coughing, sitting or sneezing. Often times, people suffering from sciatic pain are given a combination of stretches for the piriformis muscle and adjustments by a chiropractor. The piriformis is attached to the sacrum, so when this bone is shifted out of alignment, it puts abnormal tension on the piriformis creating the sciatic nerve pain. Great results are achieved through natural and conservative methods by treatment from a chiropractor. Care for other causes of sciatica are very often effectively treated by chiropractic and chiropractic has consistently been shown to be an excellent starting point when seeking care for sciatica. At Gallatin Valley Chiropractic the doctors take time with a thorough exam to determine the cause of sciatica symptoms to provide appropriate care and recommendations for you.